"Hosana" Printable I found here, plastic colored eggs from the $1 isle at Michaels, a bag of moss from Dollar store, pink glass bottles from Target dollar isle ($3 each). 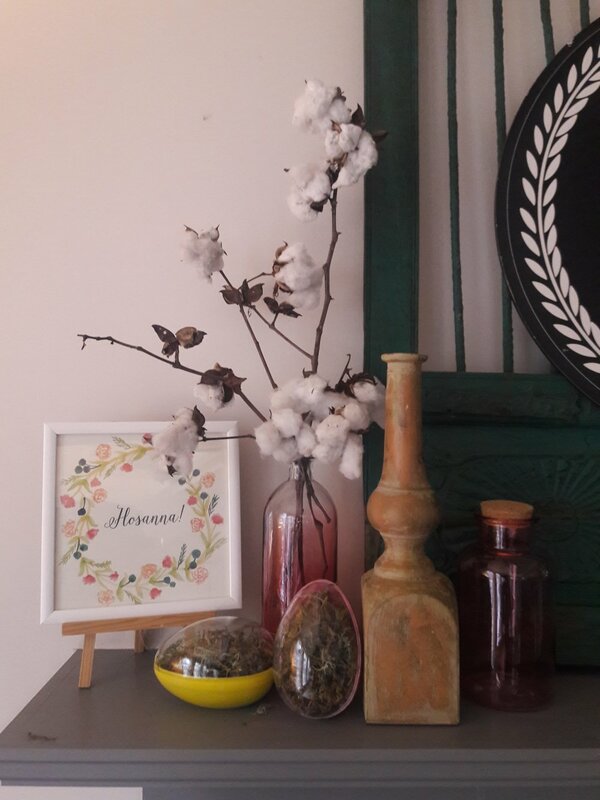 The cotton stems I already had, along with the wood candle stick. Bunny printable found here, plastic oval frame was $4 from walmart (It was gold, I painted it with craft acryllic paint), the two plastic eggs are from Michaels for $1 and I filled them with moss that I got from the dollar store. I have this on my coffee table. 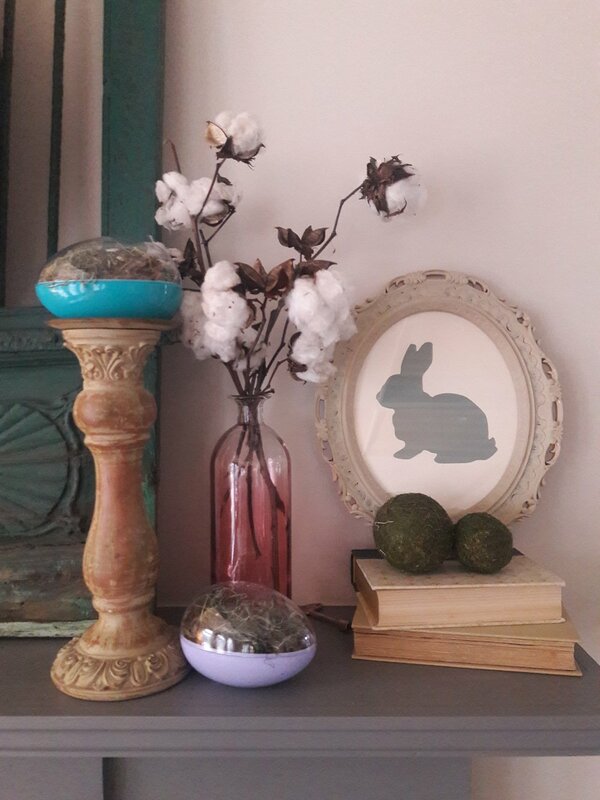 The bunny, "hello" candle and 6 wooden eggs are all from the dollar isle at Target ($3). Aren't they cute. I got the square of moss at Michaels with all their Spring decor. I bought these wicker chairs on Craigslist a couple years ago for a steal. Always told myself I would recover the cushions and possibly paint them. Well, I finally got around to it this week, except I didn't recover the cushions, I painted them! I watched some tutorials on You Tube about painting fabric and gained the confidence to try it out. I had some left over Anne Sloane Chalk Paint in Chateau Grey, so I went with that. I painted the first coat slowly and with a good amount of paint. Laid them out in the sun to dry for about 2 hours. Then I took a really fine grit sanding sponge and rubbed them down to take a good bit of the stiffness out of them. I liked the way it took off some of the paint making the cushions look more like fabric. I then lightly painted a second coat, let it try and again lightly sanded them. As far as the chairs, I watered down what little bit of paint I had left from when I painted my walls. It's a semi-gloss paint in Wind Rush by Home Decorators Collection. I didn't soak my brush with paint. I scraped quite a bit off so that it looked like chairs that had been faded in the sun for a while. In some areas, when the white got too solid, I took a damp dish towel and wiped across the wicker to rub some off. I love the weathered look it gives. They feel more coastal in this weathered white and the grey/greenish combination. They were much more traditional in their former style. We used everything we already had to create "new" beautiful chairs we love. I had $100 to spend on decorations for a little girls birthday party. My first stop was The Dollar Tree to get started. I was so surprised when $47 later, I walked out of there with almost everything I needed to pull together a dining table and snack table theme for a group of 7 little girls. Check out the photos below of how I pulled it together. Putting the Christmas decorations away can feel just as exciting as getting them out. Seeing our home transform, whether it's for the holidays, arriving guests, or back to normal...changing up our home can bring life. It can also, bring stress, extra work, and uncertainty. For me, when the Christmas decorations go away, I can stand back and look at my home like a blank canvas. I can decide if I want to put the same decorations back where they were before the holly berries and wreaths took their spots. I love that when the Christmas decorations go away, I can put back the old one in all new spots. What about you? Does the same happen for you? Do you find new places for those things that have been packed away for the last 30 days? How do you put your home back together for the new year starting? If you need help, or want to make things feel new by putting them in new locations, let me come and help you. Giving homes a "new" look is a great way to start the New Year!